Today I was fascinated by a news report that an American has claimed a piece of the planet that apparently belonged to no country i.e. it was Terra Nullius. He has named it the Kingdom of North Sudan and declared himself as king. I do not have sufficient knowledge of International law to know how far this claim is valid or if it is a joke. However just for fun and as an experiment it is decided to repeat this exercise with a new Island that emerged earlier this year in the Antarctica along with an apparently previously unclaimed sector of the Antarctica – Marie Byrd land. The name Pi Island has been tossed around for the new island because the day of it birth 3/14 and this name has inspired the name of the new Kingdom. 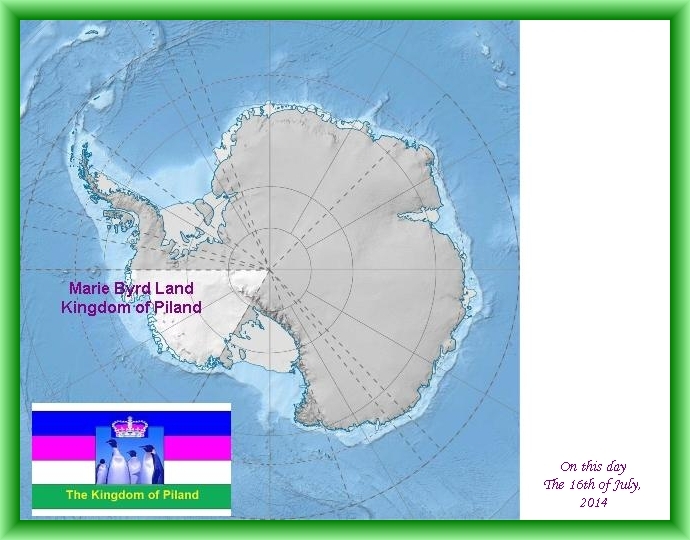 Therefore, if not contrary to law, I claim this island, including it in this Kingdom of Piland, a new country that includes Marie Byrd Land and islands in that sector off the coast of Marie Byrd Land declaring myself as the King Emperor of Piland. Presently the population primarily consists of visiting Penguins. :- ) but it shall eventually hopefully become a constitutional monarchy on the lines of UK with a written constitution in future. Until then proclamations of the King shall be law. 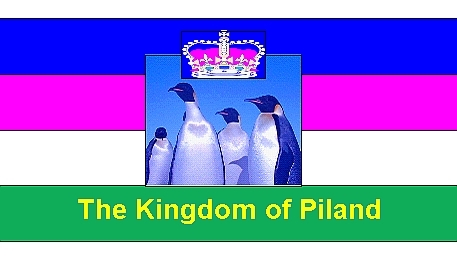 By this proclamation dated the 16th of July 2014, We the King Emperor declare Tsaven of https://www.blogger.com/profile/02361550958689286343As the Duke of the Piland Island, i.e the newly emerged island. This honor being bestowed on him due to his revealing the island to the world at http://frozennerd.blogspot.in/2014/03/a-new-island-is-born.html Subject to his acceptance of this honor. All citizens of the world are regarded as adjunct citizens of the Kingdom of Piland, if they so desire, and may visit freely without visa or restriction and live or visit the Kingdom of Piland if they wish provided they do not carry out any activity to damage the environment in any substantial way and do not hurt or kill any plant, animal or fish beyond what is required for their short term food, clothing or shelter needs. – By Proclamation of the King Emperor of the Kingdom of Piland The creation of the Kingdom is an attempt to protect the planet from any unnecessary exploitation aside from an exploration of new innovative laws and practices. The primary goal of creation of the Kingdom of Piland is to make contributions towards protecting and enhancing the environment of the planet. It goes without saying that as long as there is no fairly permanent human settlement and habitation in the Kingdom of Piland by persons who regard themselves as its citizens, the Kingdom must remain a merely symbolic thing or a game in virtual space or at best a first step only. Yet it is not impossible that an unexpected turn of events would make such a settlement possible. It would then become a physical reality. The basic purpose of life appears to be to evolve. In ancient times when civilization began, humans applied their mind to this notion. They came up with a large number of practices designed to improve body, mind and soul of humans. Many such practices were described by a common name Yoga. Depending upon the precise practice there are very many different types of yoga such as hatha yoga, kriya yoga, karma yoga and so on for the ways to improve body, mind and soul must be countless. What was described was that everything we do or even think, increases a certain quantity in the universe as a whole called entropy. Processes and actions that generate less entropy are more efficient than those that generate higher entropy. This principle applies not just to living beings but also to machines. For example a high entropy automobile would guzzle up much more fuel than another one of similar specifications and size that is low entropy generating one. Amongst humans we have high entropy persons i.e. those who generate a lot of entropy during the process of living, relatively speaking. Generally high entropy person are those who are dishonest, disorderly and unclean. In comparison a low entropy person is honest, clean, orderly and disciplined. Persons do not become high entropy or low entropy persons because they practice yoga consciously since many have not even heard of it but because it is their nature to do so. A low entropy person may easily be recognized as more evolved compared to a high entropy one. Some may ask what has honesty to do with evolution. It has, because look at a monkey it will steal a banana from your kitchen and hand without any compunction but most humans would think twice about it. The lowest entropy person is a zero entropy person i.e. someone who generates no entropy at all in whatever he does. In science such a process is called an isentropic process. Therefore such a person may be called an isentropic personality. 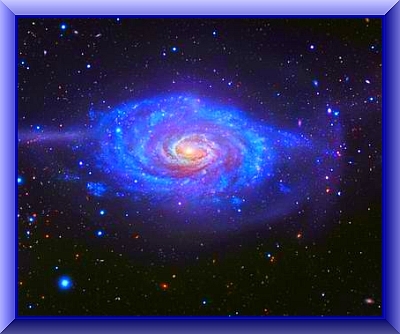 It is an ideal state and by definition there is only one isentropic personality in the Universe – God. Other beings may approach this state as they evolve but if they eventually reach this ideal they lose their individuality and become a part of the one and only Infinite being, a state also known as Nirvana by Buddhists. However since other processes and beings continuously increase the entropy of the universe as a whole, a day will come when the entropy of the universe would be unsustainable and require its annihilation. When a large number of persons in a country are high entropy persons or if its governing structures and systems are high entropy processes then the country as a whole becomes a high entropy country, conversely it is a low entropy country. It goes without saying that high entropy countries are marked by disorder, corruption and inefficiency. High entropy countries are the undeveloped parts of the world or become so whereas low entropy countries are developed or soon become so. At the present time it is perhaps some countries such as Switzerland, Denmark, Sweden and Germany that are the lowest entropy countries of the world. At one time UK, in the later Victorian era and after, was also a very low entropy country. These things change with time. In Asia Singapore and Japan are examples of low entropy countries. At the present time perhaps Syria is the highest entropy country in the world. Sub-Saharan countries and South Asian ones are also some of the highest entropy countries of the world. High entropy countries are marked not just by the presence of disorder and uncleanness but also lack punctuality, constantly changing practices and schedules aside from all possible manners of disorder. During my life time the design of coins, telephone numbers and schedules of examinations has changes so many times in India that it is difficult to even enumerate. It goes without saying that train timings and every other time including those of meetings and wedding ceremonies are never ever punctual. On the other hand, I have lived in Canada too and during my life time the design of coins, university exam schedules and my old phone number has not yet changed, although they added a new coin called the Loony some decades ago. The first is an example of a high entropy country and the second a low entropy one. It was not always like this in India. One of its earliest civilization, called the Indus valley civilization is an example of the lowest entropy civilization mankind has ever seen on the planet. Recently, India elected a new government. The new leader – Narendra Modi – appears to be a low entropy personality of a high order. Indeed the first aspiration he expressed for India was of cleanliness, a desire for a low entropy state. Perhaps under his leadership India will once again begin its long march to becoming a low entropy country. The 1951 United Nations Convention Relating to the Status of Refugees has adopted the following definition of a refugee: Any person who owing to a well-founded fear of being persecuted for reasons of race, religion, nationality, membership of a particular social group, or political opinion, is outside the country of his nationality, and is unable to or, owing to such fear, is unwilling to avail himself of the protection of that country“. The concept of a refugee was expanded by the Convention’s 1967 Protocol and by regional conventions to include persons who had fled war or other violence in their home country. 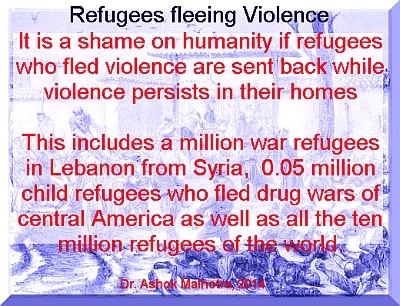 At the present time there are millions of refugees in different countries of the world. The numbers of refugees in Lebanon from Syria are over a million. As a Party to the 1967 Protocol, the U.S. is obliged to recognize valid asylum claims under the 1951 Convention and 1967 Protocol. The Refugee Act of US of 1980 is the domestic legislation governing asylum law in the U.S. The Refugee Act codifies the obligations of the U.S. under the 1951 Convention and 1967 Protocol. While America seems to be flustered over the issue it must note that when a small country like Lebanon, that is approximately one thousand times smaller than America and much poorer can host more than a million Syrian refugees, it would not be an impossible feat for America to host 0.05 million child refugees. Moreover these are traumatized children in desperate need. However, the first step is to recognize that these children are refugees and not immigrants and in no case are they illegal in absolutely anyway.